Prosecutors on Saturday released the Cuyahoga County Sheriff’s investigation into the death of Tamir Rice, revealing interviews with witnesses and Timothy Loehmann, the cop who shot the 12-year-old boy. County Prosecutor Tim McGinty released some 250 pages of investigation material just after 3 p.m., according to WKYC. One of the statements released was made by Loehmann, who said he had “no choice” but to shoot Tamir when he “reached for his gun,” which turned out to be a BB gun. The sheriff’s office didn’t offer an opinion on the criminality of Loehmann’s actions that day, but the material will be forwarded to a grand jury, which will determine if charges should be brought against the officer. A Cleveland Municipal Court judge said Thursday that there was probable cause to charge Loehmann with involuntary manslaughter, reckless homicide, negligent homicide and dereliction of duty. But McGinty reiterated that he’ll leave the decision to the grand jury. “Transparency (i.e., the actual facts) is essential for an intelligent discussion of the important issues raised by this case,” McGinty said in a statement released with the new material. “We are now in the process of reviewing this report and deciding what additional investigation is needed. That is the way that every significant investigation works: The Sheriff’s investigation is a good solid foundation that will support the grand jury’s own investigation. “Tamir’s family, the people of this community and the officers involved deserve nothing less than the most thorough investigation and analysis possible,” he said. The investigation documents show that Loehmann and responding officers thought Tamir’s gun was real, and reveals the mindset of witnesses and officers on the scene. It also shows that Loehmann leaped out of his patrol vehicle and two seconds passed before he shot Tamir twice. 19 Action News compiled the all of the documents, which can be viewed below. For a solid, brief overview, visit WKYC. 2. Interviews, requests and the Cuyahoga County Medical Examiner’s report. It’s not clear why McGinty decided to release the full report, which was compiled over the course of four months, to the public. An ongoing federal lawsuit filed by the family of Tamir Rice prompted a response from the city of Cleveland last week arguing that the 12-year-old was responsible for his own death. The city’s claims caused outrage from family and community members, and perhaps led to a public apology from Cleveland Mayor Frank Jackson who shared the city’s regrets for the language they used. “This is not the character or personality of the city of Cleveland to be that insensitive to the family or even the victim,” Jackson said at a news conference on Monday March 2, 2015. A series of defenses filed on Friday show that the city claimed Rice’s fatal shooting was a result from his failure to “exercise due care to avoid injury” and that the family’s “injuries, losses and damages” were caused by their own acts. Rice died on Nov. 22 after officers responded to a call about a person holding a firearm near a recreation center. Officer Timothy Loehmann, a rookie cop who has received poor performance reviews in the past, fatally shot Rice almost immediately upon arrival. It was quickly revealed Rice had been carrying a non-lethal toy gun with plastic pellets in which the incident was also captured on video. In further defense of the officer’s actions, Steve Loomis, the president of the Cleveland Police Patrolman’s Association, suggested that Tamir’s height and stature also played a role in his death. In response, Madison slammed this theory and expressed his thoughts on how Loomis’ comments were another example of victim-blaming. Supporters of the family of Tamir Rice are outraged over the city of Cleveland’s claim that the 12-year-old boy was responsible for his own shooting death. Tamir Rice was killed on Nov. 22 outside a recreation center by police officers who were responding to a report of a person with a gun. Rice, who was playing with a pellet gun, was shot within seconds after officers arrived at the scene by rookie cop Timothy Loehmann, who reportedly said he had “no choice” but to defend himself. The family’s lawsuit, filed in December, alleges police used excessive force and failed to immediately provide first aid. Not surprisingly, the city’s seemingly cold response has drawn considerable outrage online. The city’s attorneys did not immediately respond to requests seeking further comment. Last week, the head of the Cleveland Police Patrolman’s Association suggested Tamir was an adult-size suspect. In its 41-page filing, the city said it is not able to fully respond, because the Cuyahoga County Sheriff’s Office’s investigation into Rice’s death is not finished. An attorney representing the Rice family called the video “shocking and outrageous.” “This has to be the cruelest thing I’ve ever seen,” Akron-based attorney Walter Madison said. The video confirmed earlier claims made by Tamir’s mother, Samaria Rice, and her legal team at a Dec. 8 press conference that an officer cuffed her daughter as she ran to check on her brother and that officers waited several minutes before administering first aid. The city is hoping to hand over the investigation of a 12-year-old boy’s fatal shooting by police to an outside agency, as well as future investigations of all deadly use-of-force cases. For now, Cleveland police investigators are collecting evidence and conducting interviews related to the Nov. 22 shooting of Tamir Rice. The boy was carrying an airsoft gun that shoots nonlethal plastic pellets when a rookie officer shot him at a Cleveland playground. Surveillance video released by police shows Tamir being shot less than two seconds after the patrol car stopped near him. Officer Timothy Loehmann told the boy to put his hands up, but he didn’t. Cleveland Police Patrolmen’s Association President Jeff Follmer recently claimed officers had no way of knowing the boy was carrying an airsoft gun which only looked like a real firearm. Incoming Cuyahoga County Executive Armond Budish has participated in multiple meetings between Cleveland and sheriff’s officials since the shooting, said Dennis Williard, a spokesman for Budish’s transition team. Whoever leads the investigation will give its evidence to Cuyahoga County Prosecutor Timothy McGinty, whose office will present the case to a grand jury for possible criminal charges. Cleveland police have come under outside scrutiny on other cases recently. Last month, the U.S. Justice Department released findings from a nearly two-year investigation of the agency, an inquiry that did not include Tamir’s shooting. The department concluded that officers use excessive and unnecessary force far too often. In 2013, Ohio Attorney General Mike DeWine said leadership and communications failures led to a chaotic 2012 police chase that ended with 13 officers firing 137 rounds and killing two unarmed people. Tamir Rice’s family has sued the city in federal court, saying the two officers acted recklessly when they confronted the boy. The mother of 12 year-old Tamir Rice was fatally shot by police last month broke her silence on Monday, saying the officers involved should be criminally convicted. “I’m looking for a conviction for both of the officers,” Samaria Rice, the mother of Tamir Rice, said on ABC’s “Good Morning America” program. Rice said her 14-year-old daughter, went to the scene after the shooting, was tackled, handcuffed and put in the back of a police car. Both officers involved in the shooting are on administrative leave and the shooting is being investigated by Cleveland authorities. The case will go to a grand jury for possible charges. Rice’s family filed a suit last week against the city of Cleveland and both Timothy Loehmann, the officer who shot Rice, and Frank Garmback, who was driving the car. Rice sat with her attorney, Benjamin Crump, who has also represented the family of Michael Brown, the unarmed black teenager whose fatal shooting by police in Ferguson, Missouri, led to months of protests. In the Brown case, as well as a New York case involving the death of a black man during an arrest, grand juries declined to indict the officers involved. CLEVELAND, Dec 5 (Reuters) – The family of a 12-year-old Cleveland boy who was fatally shot by police filed a federal civil rights and wrongful death lawsuit on Friday against the city and the police officers involved. Tamir Rice was shot last month while carrying what turned out to be a replica gun that typically fires plastic pellets. The shooting came at a time of heightened national scrutiny of police use of force, especially against African-Americans. The suit names both Timothy Loehmann, the officer who shot Rice on Nov. 22 less than two seconds after the police car pulled up beside the boy at a park, and Frank Garmback, who was driving the car. The suit said that the officers confronted Rice, “in a surprise fashion and fired multiple shots at him without any adequate investigation.” The suit said that Rice lay on the ground alive for four minutes without medical care. Representatives for the City of Cleveland were not immediately available for comment on the lawsuit. Both officers are on leave and the incident is being investigated. The lawsuit comes a day after the U.S. Department of Justice announced that Cleveland Police systematically engages in excessive use of force against civilians. Tim Loehmann, the Cleveland police officer who shot 12-year-old Tamir Rice to death last month, resigned from a smaller Ohio police force in 2012 after being found unfit for duty. Among other obviously disqualifying behavior, Loehmann was “distracted” and “weepy” during his firearm qualification session, according to just-released records from his brief tenure with the Independence police department. Loehmann’s troubles began in 2012 while he attended the Cleveland Heights Police Academy. An issue with an on-again, off-again girlfriend caused Loehmann distress and, in one case, he fell asleep during training, according to a written report from Independence Police Sgt. Greg Tinnirello. The problems at Independence erupted on Nov. 28, 2012, the records say. Loehmann showed up “sleepy and upset” for a 6 a.m. state gun qualification session. Tinnierello wrote that Loehmann “was distracted and was not following simple instructions” at the shooting range. At one point, he went to the back of the range to reload his magazine and could not return to the line where he was supposed to shoot from, Tinnierello wrote. Loehmann appeared to be crying and was emotionally upset so Tinnierello said they would stop the exercise for the day. Loehmann resigned from the Independence force on December 3, 2012, just four days after Polak’s letter and six months after joining the department. In March 2014, Loehmann joined the Cleveland police department, in part, according to his father, because he wanted “more action” than the Independence department could offer. On November 22, Loehmann opened fire on 12-year-old Tamir Rice, who was holding a BB gun, just 1.5 seconds after arriving on the scene at a Cleveland park. Rice died the next morning. The group further questioned whether the police were so “moronic” that they were unable to use anything other than lethal force to deescalate the situation. They called the justification that the police“feared for their lives” ludicrous, as Rice was only 12-years-old and armed with an air soft gun. The message concluded with a vow to target all municipalities whose “ignorant” and poorly-trained officers pose a threat to society. According to Cleveland police statement, upon arrival on scene, officers located the suspect and advised him to raise his hands. “The suspect did not comply with the officers’ orders and reached to his waistband for the gun. Shots were fired and the suspect was struck in the torso,” the statement reads. Upon further investigation, the boy’s “weapon” turned out to be an air gun “resembling a semi-automatic pistol, with the orange safety indicator removed,” the statement adds. The president of the Cleveland Police Patrolmen’s Association told The Associated Press, however, that the officers responding to the incident were not told the caller believed the gun was not real. Rice, who was shot twice in the stomach, died of his wounds on Sunday. Two officers have been placed on administrative leave pending an investigation. One officer somehow managed to sustain an injury to his ankle and was transported to Fairview Hospital for treatment, police said. Monday’s Anonymous action is only the latest civil rights furor the collective has weighed in recent times. The group is currently involved in an ongoing struggle both with the Police Department of Ferguson, Missouri, and the Ku Klux Klan (KKK). On Wednesday, they released a video warning that if either Ferguson police or the KKK used violence against peaceful protesters they would face consequences. The Cleveland officers who shot a 12-year-old boy holding a toy gun then failed to give him first aid for nearly four minutes. The boy was finally administered first aid when a detective and FBI agent arrived at the scene. But it was too late. 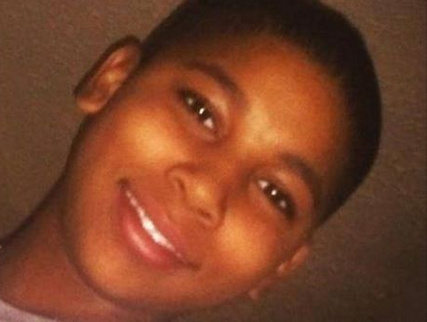 The boy, Tamir Rice, died after being transported to the hospital. According to newly surveillance video, Rice was shot by the officers within two seconds of their arrival at the scene. Cleveland Police Dept. is reporting officers shot and killed 12-year-old ‪#‎TamirRice‬ 1.5 to 2 seconds between the time the patrol vehicle arrived and the devastating police killing. Police claim the 12-year-old boy was waving a toy gun when officers opened fire and killed the child. Under pressure from Tamir’s loved ones and community, Cleveland Police were forced to release the video of the horrifying police killing today. Police said during the conference that “It’s a legitimate question” as to why the car pulled up so close to Rice. Why, if the officers thought he had a weapon, would they pull up to within 5 feet of him? Wouldn’t you stop and exit the vehicle, say 30-40 feet away to allow you to evaluate the threat from a distance? Open the doors and stand behind them while you figured things out? If the child was a real threat, both cops could be dead. But by not giving themselves any time to evaluate the threat and just quickly react, this tragedy was forced by their proximity. I can’t believe pulling all the way up to the suspect was proper police procedure. So, the shooter was a rookie. Was the driver a cowboy? 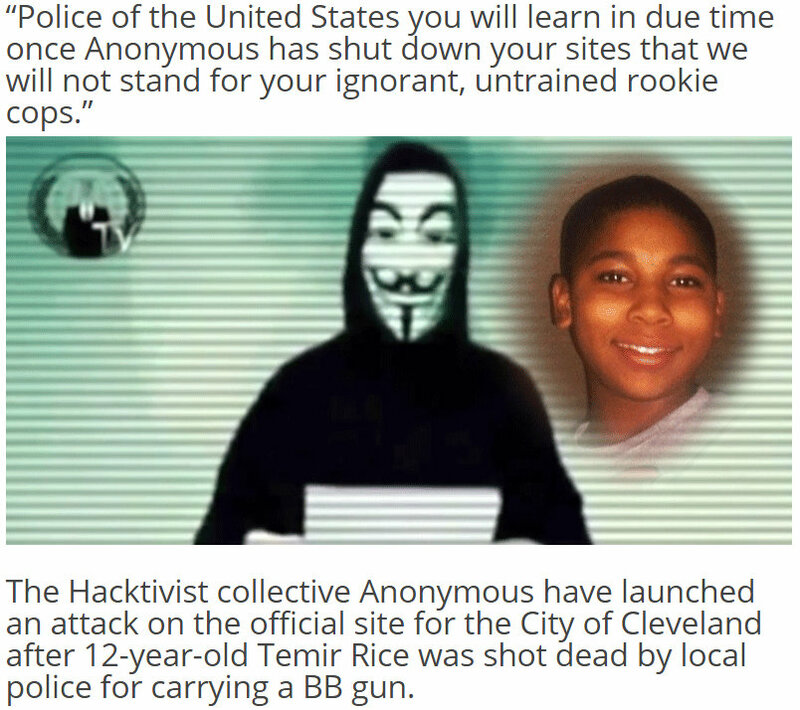 Last weekend, 12-year-old Tamir Rice was killed by a Cleveland police officerresponding to a 911 call. The caller was concerned about the young black boy who appeared to be handling a gun at a park. The firearm, it turned out, was only an Airsoft pellet gun — and although the orange plastic ring indicating it wasn’t an actual weapon had been removed, the caller did say the gun was “probably fake.” But that detail was apparently not relayed to responding officers, who shot Tamir twice in the torso just seconds after they arrived at the scene. Tamir died later at a hospital. Hours before the public was to see a video of Tamir’s last moments, editors at the Northeast Ohio Media Group decided that it was important to point out that Tamir’s father and mother both have criminal records. While the domestic violence charges against Tamir’s father are indeed disturbing, it’s hard to see what they have to do with the death of an innocent black child at the hands of a police officer. This coverage was criticized by many as an attempt to smear the victims’ characters and distract from the issue of police violence — and, more subtly, to suggest that the killing of young black men is somehow acceptable or unsurprising. And it succeeded — these stories were used by some people to explain why Martin and Brown deserved to die, or how they may have somehow invited their own deaths. Brandon Blackwell, the author of the story about Tamir’s father, was the subject of heavy critique on Twitter once the piece went live. He told one critic that he’s also planning to report on the officer who killed Tamir. Blackwell didn’t immediately respond to HuffPost’s request for comment. Mark Naymik, a reporter at the Northeast Ohio Media Group, offered an explanation that reflects a disappointingly common attitude in situations like this. Rather than asking why police officers were so quick to exercise lethal force on a 12-year-old boy playing with a toy gun, as 12-year-old boys everywhere do, some people are asking instead how Tamir’s parents could have allowed their child to get his hands on a fake weapon in the first place. Instead of focusing on how young black males face a far greater risk of being killed by police than their white peers, they blame the grieving parents — a mother and father who, whatever their legal history, will be going to sleep tonight without their son. UPDATE: 11/28/14 — After receiving criticism for their original story on Rice’s father, the Northeast Ohio Media Group added an update to “give insight into the motivation to investigate the parents’ background,” claiming that “People from across the region have been asking whether Rice grew up around violence.” Chris Quinn, vice president of content for the Northeast Ohio Media Group, then defended the decision to run the story in a column published Thursday. One way to stop police from killing any more 12-year-olds might be to understand the forces that lead children to undertake behavior that could put them in the sights of police guns. So our reporters at NEOMG have been looking into Tamir’s background, to see if he lived a life exposed to violence that could explain why it might be normal for him to randomly aim what looks like a real gun in a public place. They have pursued tips about his life from Cleveland to Strongsville and continue to investigate.